So uh... Some people asked me if I was still in Egypt or whatever. Actually I just had those blog entries written up a long time ago but hadn't posted them. I've been loafing at my brother's place in Uganda for exactly three months today. In Ethiopia there was no internet to speak of so I didn't write any blog entries. Also the pictures I took are mostly rubbish. 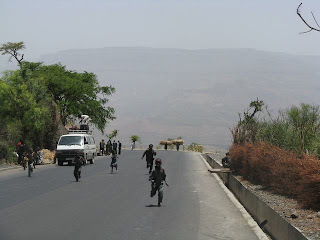 The picture in this blog entry was meant to be a mini-bus (called taxi in Ethiopia), two old ladies carrying huge loads of firewood, and the distant hills. Instead what you get is a picture of children all over the place. Foiled again! I flew from Cairo to Addis. The plan in Ethiopia was to cycle north to Gondor and then south to Kenya.